The game had a very big importance for second-ranked Windy City Bulls as it allowed them to take a leadership position. Windy City Bulls defeated 4th ranked Blue Coats in Hoffman Estates 119-110. Windy City Bulls made 18-of-23 free shots (78.3 percent) during the game. Worth to mention a great performance of forward Kaiser Gates (203-96, college: Xavier) who helped to win the game recording a double-double by scoring 20 points and 15 rebounds and forward JaKarr Sampson (206-93, college: St.John's) who added 21 points and 6 rebounds during the contest. Forward Ryan Anderson (206-92, college: Arizona) responded with a double-double by scoring 19 points, 17 rebounds and 4 assists. Blue Coats' coach rotated ten players in this game, but that didn't help. As mentioned above they are alone now at the top position. Blue Coats at the other side keep the fourth place with 18 games lost. Leading Rio Grande Valley Vipers (22-11) recorded its eleventh loss in Hidalgo. Hosts were defeated by third ranked Erie Bay Hawks (16-14) 114-109. It ended at the same time the seven-game winning streak of Rio Grande Valley Vipers. The winners were led by forward Terrence Jones (206-92, college: Kentucky) who had that evening a triple-double by scoring 20 points, 11 rebounds and 14 assists and Alex Poythress supported him with 26 points, 9 rebounds and 5 assists. Even a double-double of 19 points, 18 rebounds, 7 assists and 6 blocks by German power forward Isaiah Hartenstein (211-98) did not help to save the game for Rio Grande Valley Vipers. Rio Grande Valley Vipers' coach tested ten players, but that didn't help to avoid defeat in this game. Erie Bay Hawks maintains third position with 16-14 record having just three points less than leader Windy City B. Rio Grande Valley Vipers at the other side still keep top place with 11 games lost. A very close game took place in Salt Lake City between Salt Lake City Stars and Sioux Falls Skyforce. Second ranked Salt Lake City Stars (16-15) got a very close home victory over their close opponent Sioux Falls Skyforce (22-12). Salt Lake City Stars managed to escape with a 2-point win 116-114 in the fight for the second place. The best player for the winners was Isaiah Cousins who scored 32 points, 5 rebounds and 4 assists. Raphiael Putney produced a double-double by scoring 21 points, 15 rebounds and 4 assists for the guests. Salt Lake City Stars maintains second position with 16-15 record having just two points less than leader Windy City B. which they share with defeated Sioux Falls Skyforce. Loser Sioux Falls Skyforce keeps the second place with 12 games lost. Salt Lake City Stars will meet league's second-placed Capital City Go-Go in the next day and it will be for sure the game of the week. Sioux Falls Skyforce will play against Texas Legends in Frisco and it may be a tough game between close rivals. Very significant was Raptors 905's (#2, 20-11) victory against their close opponent Capital City Go-Go (17-13) 137-104. Jordan Loyd orchestrated the victory by scoring 15 points, 7 rebounds and 9 assists. Raptors 905's coach felt very confident that he used 11 players which allowed the starters a little rest for the next games. Raptors 905 have a solid three-game winning streak. Defending champion maintains second position with 20-11 record having just one victory less than leader Windy City B. which they share with defeated Capital City Go-Go. Newly promoted Capital City Go-Go keeps the second place with 13 games lost. Raptors 905's next day opponent will be league's second-placed Fort Wayne Mad Ants on the road and it will be for sure the game of the week. Capital City Go-Go will play against the league's second-placed Salt Lake City Stars and it may be a tough game between close rivals. Very significant was Warriors' (#1, 24-8) victory against 3rd ranked Hustle (18-14) 110-91. Worth to mention a great performance of Kendrick Nunn who helped to win the game recording 30 points and 4 assists. Both coaches used bench players and allowed the starting five to rest. Warriors maintains first position with 24-8 record. Loser Hustle keeps the third place with 14 games lost. Warriors will face league's leader OKC Blue in Oklahoma City in the next day and it will be for sure the game of the week. There were no shocking results in the other games in day 80: Agua Caliente C. lost to Lakeland M. on the opponent's court 120-131. Long Island N. managed to outperform Texas L. in a home game 135-127. Canton C. recorded a loss to Maine RC on the road 94-86. The most impressive stats of the last day was 21 points, 5 rebounds and 10 assists by Troy Caupain of Lakeland M.. Very significant was Raptors 905's (#2, 20-11) victory against their close opponent Capital City Go-Go (17-13) 137-104. Raptors 905 forced 19 Capital City Go-Go turnovers. Their players were unselfish on offense dishing 37 assists comparing to just 20 passes made by Capital City Go-Go's players. Raptors 905 brought some defensive toughness making 9 blocks. Guard Jordan Loyd (193-93, college: Indianapolis) orchestrated the victory by scoring 15 points, 7 rebounds and 9 assists. 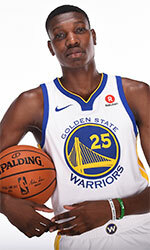 Canadian-Saint Lucian power forward Chris Boucher (208-93, college: Oregon) contributed with a double-double by scoring 18 points, 11 rebounds and 5 blocks (on 8-of-10 shooting from the field) for the winners. Raptors 905's coach felt very confident that he used 11 players which allowed the starters a little rest for the next games. Guard Chris Chiozza (183-95, college: Florida) replied with 15 points, 6 assists and 4 steals and Croatian-American forward Duje Dukan (208-91, college: Wisconsin) added 16 points and 8 rebounds (was perfect 7-for-7 from the free throw line) in the effort for Capital City Go-Go. Both teams had five players each who scored in double figures. Raptors 905 have a solid three-game winning streak. Defending champion maintains second position with 20-11 record having just one victory less than leader Windy City B. which they share with defeated Capital City Go-Go. Newly promoted Capital City Go-Go keeps the second place with 13 games lost. Raptors 905's next day opponent will be league's second-placed Fort Wayne Mad Ants on the road and it will be for sure the game of the week. Capital City Go-Go will play against the league's second-placed Salt Lake City Stars and it may be a tough game between close rivals. Leading Rio Grande Valley Vipers (22-11) recorded its eleventh loss in Hidalgo. Hosts were defeated by third ranked Erie Bay Hawks (16-14) 114-109. It ended at the same time the seven-game winning streak of Rio Grande Valley Vipers. Erie Bay Hawks players were unselfish on offense dishing 32 assists. The winners were led by forward Terrence Jones (206-92, college: Kentucky) who had that evening a triple-double by scoring 20 points, 11 rebounds and 14 assists and forward Alex Poythress (203-93, college: Kentucky) supported him with 26 points, 9 rebounds and 5 assists. Even a double-double of 19 points, 18 rebounds, 7 assists and 6 blocks by German power forward Isaiah Hartenstein (211-98) did not help to save the game for Rio Grande Valley Vipers. Forward Dakarai Tucker (196-94, college: Utah) added 34 points (!!!) for the hosts. Five Erie Bay Hawks and four Rio Grande Valley Vipers players scored in double figures. Rio Grande Valley Vipers' coach tested ten players, but that didn't help to avoid defeat in this game. Erie Bay Hawks maintains third position with 16-14 record having just three points less than leader Windy City B. Rio Grande Valley Vipers at the other side still keep top place with 11 games lost. Very significant was Warriors' (#1, 24-8) victory against 3rd ranked Hustle (18-14) 110-91. Warriors made 19-of-23 free shots (82.6 percent) during the game. They also forced 19 Hustle turnovers and outrebounded them 50-34 including 16 on the offensive glass. Worth to mention a great performance of guard Kendrick Nunn (190-95, college: Oakland, agency: Pensack Sports) who helped to win the game recording 30 points and 4 assists and point guard Will Cherry (185-91, college: Montana) who added 21 points, 7 assists and 4 steals during the contest. Four Warriors players scored in double figures. Japanese guard Yuta Watanabe (206-94, college: G.Washington) responded with 18 points and 5 rebounds and forward Kyle Casey (201-90, college: Harvard, agency: Inception Sports) scored 14 points and 9 rebounds. Both coaches used bench players and allowed the starting five to rest. Warriors maintains first position with 24-8 record. Loser Hustle keeps the third place with 14 games lost. Warriors will face league's leader OKC Blue in Oklahoma City in the next day and it will be for sure the game of the week. A very close game took place in Salt Lake City between Salt Lake City Stars and Sioux Falls Skyforce. Second ranked Salt Lake City Stars (16-15) got a very close home victory over their close opponent Sioux Falls Skyforce (22-12). Salt Lake City Stars managed to escape with a 2-point win 116-114 in the fight for the second place. Salt Lake City Stars made 34-of-42 free shots (81.0 percent) during the game. They also forced 24 Sioux Falls Skyforce turnovers. The best player for the winners was guard Isaiah Cousins (193-94, college: Oklahoma) who scored 32 points, 5 rebounds and 4 assists. Guard Jairus Lyles (188-95, college: UMBC) chipped in 21 points, 6 assists and 4 steals. Forward Raphiael Putney (207-90, college: Massachusetts) produced a double-double by scoring 21 points, 15 rebounds and 4 assists and swingman Duncan Robinson (203-94, college: Michigan) added 26 points and 9 rebounds respectively for the guests. Four Salt Lake City Stars and five Sioux Falls Skyforce players scored in double figures. Salt Lake City Stars maintains second position with 16-15 record having just two points less than leader Windy City B. which they share with defeated Sioux Falls Skyforce. Loser Sioux Falls Skyforce keeps the second place with 12 games lost. Salt Lake City Stars will meet league's second-placed Capital City Go-Go in the next day and it will be for sure the game of the week. Sioux Falls Skyforce will play against Texas Legends in Frisco and it may be a tough game between close rivals. 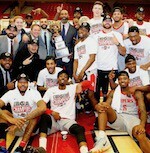 The game had a very big importance for second-ranked Windy City Bulls as it allowed them to take a leadership position. Windy City Bulls defeated 4th ranked Blue Coats in Hoffman Estates 119-110. Windy City Bulls made 18-of-23 free shots (78.3 percent) during the game. Worth to mention a great performance of forward Kaiser Gates (203-96, college: Xavier) who helped to win the game recording a double-double by scoring 20 points and 15 rebounds and forward JaKarr Sampson (206-93, college: St.John's) who added 21 points and 6 rebounds during the contest. Forward Ryan Anderson (206-92, college: Arizona) responded with a double-double by scoring 19 points, 17 rebounds and 4 assists and guard Shake Milton (198-96, college: SMU) scored 21 points, 5 rebounds and 5 assists. Four Windy City Bulls and five Blue Coats players scored in double figures. Blue Coats' coach rotated ten players in this game, but that didn't help. As mentioned above they are alone now at the top position. Blue Coats at the other side keep the fourth place with 18 games lost. Rather expected game in Lakeland where 3rd ranked Clippers (14-15) were defeated by first ranked Magic (19-11) 131-120 on Wednesday. Magic dominated down low during the game scoring 80 of its points in the paint compared to Clippers' 54. They shot the lights out from three sinking 13 long-distance shots on high 52.0 percentage. Magic looked well-organized offensively handing out 26 assists. Worth to mention a great performance of guard Troy Caupain (193-95, college: Cincinnati) who helped to win the game recording a double-double by scoring 21 points, 5 rebounds and 10 assists and swingman Anthony Brown (199-92, college: Stanford) who added 24 points during the contest. Magic's coach used an eleven-player rotation saving starting five for next games. Forward Jamel Artis (201-93, college: Pittsburgh) responded with 26 points and guard Brandon Fields (193-88, college: Nevada) scored 20 points and 6 assists. Both teams had five players each who scored in double figures. Magic maintains first position with 19-11 record. Loser Clippers keep the third place with 15 games lost. Magic will face Northern Arizona Suns (#5) in Prescott Valley in the next day. Rather predictable result in Uniondale where first ranked Long Island Nets (21-10) defeated 4th ranked Texas Legends (12-22) 135-127 on Wednesday. Long Island Nets made 39-of-45 free shots (86.7 percent) during the game. They looked well-organized offensively handing out 33 assists comparing to just 14 passes made by Texas Legends' players. Texas Legends were plagued by 35 personal fouls down the stretch. Worth to mention a great performance of center Alan Williams (203-93, college: UCSB) who helped to win the game recording a double-double by scoring 28 points and 12 rebounds and forward Drew Gordon (206-90, college: N.Mexico) who added 23 points and 10 rebounds during the contest. Guard Gary Trent-Jr (198-99, college: Duke) responded with 37 points (!!!) and 5 rebounds and Canadian guard Xavier Rathan-Mayes (193-94, college: Florida St.) scored 22 points, 6 rebounds and 8 assists. Both teams had five players each who scored in double figures. Texas Legends' coach let to play ten players, but that didn't help to avoid defeat in this game. Long Island Nets maintains first position with 21-10 record. Loser Texas Legends keep the fourth place with 22 games lost. Long Island Nets will face Austin Toros (#3) on the road in the next day, which may be the game of the day. Texas Legends will play against the league's second-placed Sioux Falls Skyforce and it may be a tough game between close rivals. We cannot really consider it an upset in the game between close teams in Portland where one of their biggest challengers Canton Charge (12-19) was defeated by fifth ranked Maine Red Claws (10-19) 94-86 on Wednesday. Worth to mention a great performance of guard Justin Bibbs (196-96, college: Virginia Tech) who helped to win the game recording 30 points and 5 rebounds and forward John Bohannon (210-91, college: UTEP) who added 21 points and 11 rebounds (on 9-of-11 shooting from the field) during the contest. Forward Jaron Blossomgame (201-93, college: Clemson) responded with 28 points and 9 rebounds and guard Scoochie Smith (188-94, college: Dayton) scored 14 points and 7 assists. Four Maine Red Claws and five Canton Charge players scored in double figures. Canton Charge's coach let to play ten players, but that didn't help to avoid defeat in this game. Maine Red Claws maintains fifth position with 10-19 record. Canton Charge lost fourth consecutive game. They keep the fourth place with 19 games lost. Maine Red Claws will face higher ranked Greensboro Swarm (#4) at home in the next day and it may be quite challenging game.